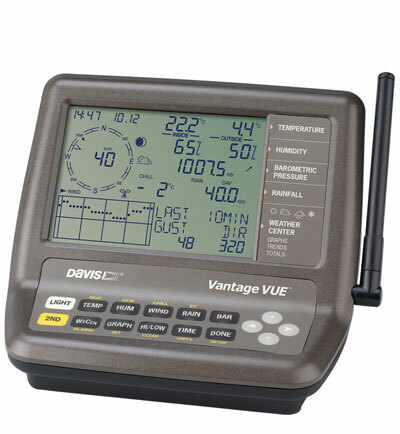 The new Vantage Vue weather station from Davis Instruments provides real-time, local weather monitoring with alarms, graphs and loads of weather details. 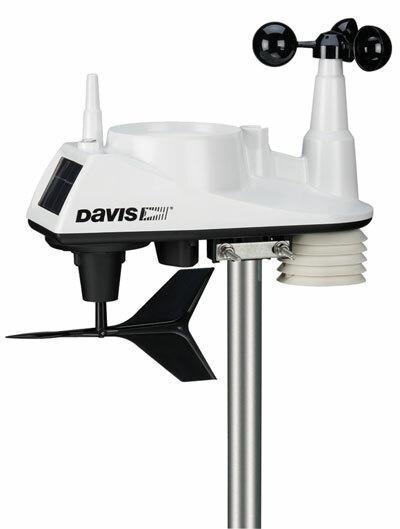 Vantage Vue works with Davis’ WeatherLinkIP software to create a personal weather website for the unit and connects it to a global network of Davis weather stations. It’s perfect for people who want to monitor weather conditions at their home, lake house, marina, yacht club or dock. The versatile Vantage Vue employs frequency-hopping spread spectrum radio technology to wirelessly send data up to 1,000′ to the console. With an easy-to-read, backlit, 3″ x 4-3/8″ LCD screen, the advanced console displays indoor and outdoor temperature and humidity, barometric pressure, wind speed and direction and rainfall. The console offers over 50 on-screen graphs and allows 22 different alarms to warn of dangers, such as high winds, possible floods, freezing temperatures and rain rate.